As you would expect on a luxury ship, this was served in 1st class on the ill fated voyage of the Titanic. Sprinkle each lobe and any loose pieces of the goose liver (foiegras) on both sides with kosher salt and white pepper. Sprinkle one third of Sauternes in terrine and firmly press large lobe of foie gras, smooth side down, into bottom. (Wedge any loose pieces of foie gras into terrine to make lobe fit snugly.) Sprinkle with another third of Sauternes. 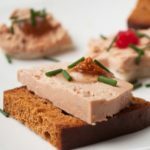 Put smaller lobe of foie gras, smooth side up, into terrine and firmly press down to create a flat surface and snug fit. Sprinkle with remaining Sauternes. Cover surface of foie gras with plastic wrap, then cover terrine with lid or foil. Put terrine (with plastic wrap and lid) in roasting pan and fill roasting pan with enough hot water to reach halfway up side of terrine. Bake in middle of oven until an instant-read thermometer inserted diagonally into center of foie gras registers 120° which takes about 3 1/2 hours. Remove terrine from pan. Discard water and remove towel. Return terrine to roasting pan and remove lid. Measure and cut a piece of cardboard trimmed to fit just inside top of terrine, wrapped well in plastic wrap. Place the cardboard directly on surface of the foie gras and set a 3 lb weight on cardboard (this will force fat to surface; don’t worry if fat overflows). Let stand at room temperature 20 minutes. Remove weight and cardboard and spoon any fat that has dripped over side of terrine back onto top (fat will seal terrine). Chill, covered, until solid, at least 1 day. Unmold foie gras by running a hot knife around edge. Invert onto a plate and reinvert, fat side up, onto serving dish. Cut into slices with a heated sharp knife. Serve on your favorite bread. If you don’t have an oval terrine, you could use a ceramic soufflé dish or a glass loaf pan that’s just large enough for the foie gras to fit in snugly.